I did have redcurrants once. Some git of a bird stripped them all off in one day. Pigeon, I'll bet. Sunshine and showers day, so pottered about a fair bit. Went up to the allotment with P in tow and picked a fair few blackberries, a couple of the yellow courgettes, several onions/shallots and a cabbage. The sweetcorn had got darker silks showing, so picked a bunch of them. The stems really are quite fragile without the extra support of the cobs, so snap off almost immediately. So must remember to harvest them only when the topmost cob is showing. Got nine of them, which pays for the seed packet! They got frozen as fast as I could get them shelled, the berries got crumbled and the cabbage coleslawed. Sowed a tray of spring cabbages, with the experimental cabbage ‘Peter' from Marshalls at one end and ‘April' at the other. Sunshine and showers. The turnips are coming up. 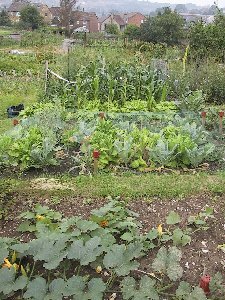 Didn't garden much - not really the time of year to do major stuff (thank goodness) but did go up to the allotment after church and rescue another cabbage, as we'd eaten all of yesterday's coleslaw… Pity that the carrots were bought as it would have been nice to have grown all of it. Still, the latest lot of carrots may well grow (hahahaha). Picked the yellow marrow as a lot of tiny females are visible and I don't want to stop them growing. The custard marrow is a hoot - growing on a quite long stem, it's about 3" wide now. Another female is now visible. 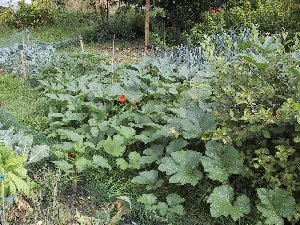 The marrow plants are doing their growth spurt at last. And the caterpillared cabbages are growing tiny new hearts, so should recover in time to a decent size. The caulis may have been a bit of a washout, but I'm very happy with the minicoles. Probably do them again next year, with some larger savoy variety &/or springs. Went to the allotment after work to see if anything had grown in the week since I last peeked. And the marrows have done that thing. 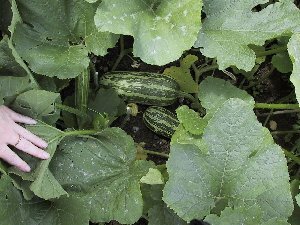 All now huge plants, with the trailers wandering up the bushes and across paths… Picked a green marrow, a custard marrow, a yellow marrow (ooops) and half a dozen large courgettes. Traded three courgettes for runner beans with Lee, and managed with his help to get several decent Bramley's off the tree. Picked a large head of broccoli and 19 sweetcorn, which have now got decidedly big, and on the verge of not being baby any more. One didn't make it home, as I had to test it! Pulled four more beets and got given some more baby carrots while I was at it. Didn't even attempt to pick any blackberries as there are far too many and I didn't have any room in my very heavy trug. Staggered home and got the corn into the freezer. Very hot again. Went to water the allotment and pulled up a lot of the pathetic autumn onions, which are smaller than the sturons I module-sowed late and which are galloping. Picked four takeaway tubs of very ripe blackberries, ducking the rather enthusiastic new briars which have appeared. Picked nine more minicorn (total picked is over 40 now, though not that many made it to the freezer!) which is over two per plant. Also picked another green courgette and some more broccoli shoots. Very hot. Walked up to the allotment (takes 12 minutes) armed with a bottle of Chablis and a cup. Watered the marrows with the holey can (leaking all over the place) and Maggie appeared as I was finishing. No Chris, so we opened her bottle (Frascati) and then invited a couple of the gents to share. Very civilised, watching balloons floating by (more than I did at the weekend! ), the sunset and chatting about what wasn't growing this year. I am not the only one with pathetic onions. Jim donated a lot of runner beans, so I have enough now for filling the freezer given mine have been devastated by the snails. Marrows are another story… will be in those for a few months! Pulled a not-so-minicole cabbage for weekend coleslaw and went home with my bottle of wine intact for next time. Hot and muggy. Spent the day pickling a jar of the pathetic onions and making bramble jelly, which of course didn't set right, despite using the jam thermometer. Must boil it up again! I need a jelly bag. Watered stuff at a run late on and picked three more courgettes that have appeared out of nowhere. There are three table dainty marrows growing in the middle of the patch, with beautiful markings. And the full sized oops green marrow on the courgette bush is about ready to pick, or at least I will pick it when I've eaten the marrow in the fridge first! Then of course there's the other yellow marrow still on the bush *grin*. There I was, changed into my gardening clothes as soon as I walked in from work, and it starts to rain after a really lovely day. Typical. The sorting out of the onion patch will have to wait until tomorrow. Luckily the turnips don't need much nitrogen, so I can get away with just stuffing them in once the patch is weeded and hoed. All 40-odd grew and are now nice little plants. Must go up tomorrow as there's a green marrow ready. Wonder what you can stuff them with if you don't want to use meat? Went up to water today and came back with the 5lb 4oz 15" long marrow. And a custard marrow. And more courgettes. And 8oz yellow French beans. And radishes. And lettuce. And more corn. And a hernia. Had another try and getting the onion patch sorted out. And again failed, simply because the soil was like granite and I only had the hand fork. Managed to extract all remaining onions and shallots, and discovered that one of the Musselburgh leeks had bolted. Pulled it (and later turned the flower stem into a sushi filling). Picked six tubs of blackberries (and gave two to the old lady by the gate). Found there were still some gooseberries! Ate some, while dodging wasps. Picked a few Bramley's, the yellow marrow, and another two beets. The modular onions are fading a bit now, so it looks like I'll only have very small ones there, too. Also picked quite a lot of broccoli. Patchy weather, between cloudy and baking hot, so perfect for gardening after yesterday evening's rain. Went up to allot just before 1pm and left about 5pm after a good afternoon's graft. 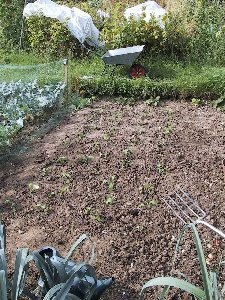 Started off just by intending to weed the onion patch, and ended up weeding the onion and garlic and shallots patches and recombining them into one big one, as the rows of well-spaced turnips were wider than the original. The ground wasn't quite as solid thank goodness, though an occasional well-rooted dandelion took the full fork to shift. Managed to get 43 turnips out of the 40-module tray, so the doubled-up seedlings are spares for if the others get eaten or keel over. They were sown a month ago, so are pretty good seedlings. Should be well on the way to a decent size by the end of September, which is as well since they aren't as frost hardy as swede.